Bonalu Festival observed in Hyderabad and Secunderabad in Telangana in India is dedicated to Mother Goddess (Shakti) and is observed in the month of Ashada (July – August). It must be noted that on the Sundays in Ashada month (June – July) temples in Telangana. Bonalu Jatara 2019 dates are July 7, July 14, July 21, and July 28. Bonalu 2019 date at the Ujjaini Mahankali Temple is July 21 and the Rangam is on July 22. The festival, which is known as ‘Ashadam Jatara’ will commence from July 7 at Sri Jagadamba Mahankali Temple atop the historic Golconda fort. Lal Darwaja, Akkanna Madanna, Bangaru Maisamma, Bhagyalakshmi temple are some of the important temples where the offering is made. The festival starts with a procession of Rottela Jathara from Langar Houz center to Golconda Sri Jagadamba Mahankali temple on the first Sunday of Ashada month. Bonalu means on ‘food’ and women in large numbers offer food to Mahankali. Bonalu Jatara is a month long affair and includes colorful processions and community feasts. 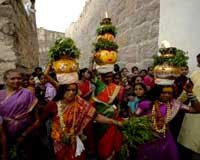 Bonalu is mainly held at the Sri Jagadamba temple in Golconda Fort, Ujjaini Mahankali Temple in Secunderabad and Matheswari Temple of Lal Darwaja. The rituals are also performed in all the other Goddess Shakti in the twin cities. In the region, Goddess Shakti is worshiped as Mahakali or Mahankali. In the region, Goddess Shakti or Kali is popularly known as Yellamma, Pochamma, Renuka Amma, Peddamma, Mysamma, Poleramma, Ankalamma and Maramma. The origin of the festival is traced to a major plague that killed thousands of people in 1869. People believed the plague was the result of the anger of the Goddess and started offering Bonalu to subdue her anger. The word ‘Bonalu’ is derived from the Telugu word ‘Bhojanalu’, the food offered. The offerings consist of cooked rice, jaggery, curd, water (known as Bonam) and other dishes which are brought in the pots and are given to the Goddesses in the temples. It is believed that the offerings ward off evils and epidemics during monsoon. The Bonalu procession is highly colorful and is accompanied thousands of people and includes Potharaju (a well-built man) and people also depict various scenes from Puranas especially those associated with the Goddess Kali legend.